brown spotted bananas on your counter? Do you find yourself in this predicament on a regular basis? There is just something about that big bag of bananas hanging out at Costco that lures me in every time. “Buy Me!” they seem to say. with at least one bag every time. 10 big bad bananas turning all spotty on me. Since I already have a Ziploc bag full of ripe bananas in the freezer…I rolled up my sleeves and got a bakin’. 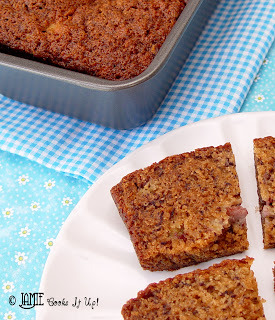 I have two wonderful banana bread recipes on the site. This fine lookin’ dandy is Buttery Blonde Banana Bread. If you are in the mood for rich, pound cake like banana bread hold on to your hats. This recipe is going to blow your pound-cake-lovin mind. Here we have Best Banana Bread. 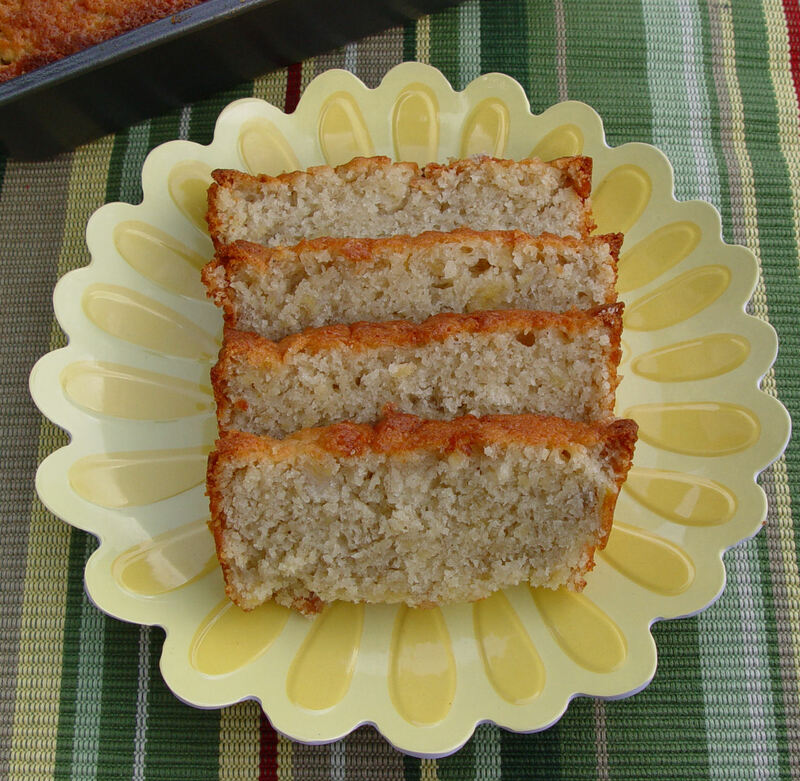 If you are in love with sugary-crusty-exteriors on your Banana Bread…make this treasure of a recipe. This lovely Best Banana Bread had her picture retaken a couple of days ago, and isn’t she looking snazzy. My old pictures of her were NOT kind. 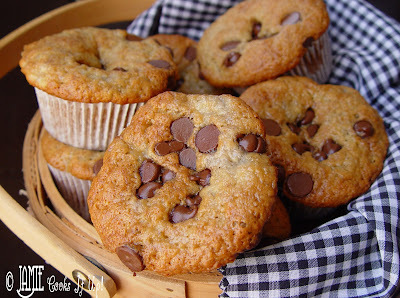 I have been on the look out lately for a great Banana Chocolate Chip Muffin recipe. I tried a couple of recipes this week and this fine dandy was definitely worth sharing! The “fat” the recipe calls for is mayonnaise! Who would have thought. I used Miracle Whip Light and they were great! My kids gobbled them up in a quick hurry and they came together in a snap. They are very light and sweet. Hope you like them as much as we do. Put those brown spotted bananas to good use my friends! You’re family will love you for it! Then buy another big bag of bananas at Costco…..that’s a good chunk of fruit for $1.39! 1. In a medium sized bowl combine flour, sugar, baking soda and salt. Set aside. 2. In your Kitchen Aid or in a mixing bowl beat the egg. Add the bananas and mix until they are all mashed up and smooth. 3. Add the mayonnaise to the banana mixture and mix for 30 seconds. 4. Add the dry ingredients and mix just until moistened. 5. Carefully spoon the batter into muffin tins, 3/4 of the way full. You can line the tins with little cupcake holders if you like. 6. Sprinkle the top of the batter with the chocolate chips. Oh....doesn't chocolate just make you smile. Yum! 7. Bake at 375 for 20-25 minutes. Oh, yum! I'm going to have to try your Buttery Blonde Banana Bread – sounds fabulous! Yum! I love bananas but sadly haven't bought any recently. I guess I'm going to have to get some now. Thanks for sharing! I'm thrilled to hear that the muffins turned out for you! My husband finished them in record time 😉 Reading your post I was slightly envious of all of your banana baking – it looks so good! I think a trip to Costco is in order for me, too (and then I have to hide the bananas so I can bake with them)! I'm also excited to try your Italian Tortellini Soup! I have it saved and am hoping to get to it this weekend – will definitely link back to you! I was introduced to this blog by a friend a few weeks ago and ever since I have enjoyed trying a couple recipes and spreading the word. I have made the french bread, banana bread and snicker surprise. TOmorrow I am goign to make the chicken enchiladas and breadsticks. Thanks for all your wonderful recipe. I can't wait till the summer (I'm a school teacher) when I have more time to try the recipes. Jamie, I have been following your blog, and I love your blog and your fun personality. Please come on over to my blog (http://tightwadmomsfrugalforum.blogspot.com/) soon to receive your Versatile Blogger Award! Great breakfast treat or snack! All of the banana recipes sound great! Can't wait to try the muffins! These are in the oven right now! When I saw this post they looked perfect for a Saturday morning breakfast treat. I just had to come back and say these WERE A HUGE HIT! My husband and son cannot stay out of them and my brother in law loves them too. They were so shocked when I said they had mayo in them. Definite two thumbs up! I'm so happy to know they were a hit! Thanks for letting me know. These muffins are fabulous! Even my banana hating daughter loves them! I did substitute half the white flour with whole wheat. Still delish! They are fabulous! I want to have them and prepare it at home. Congrats for the best recipes! We own a Wall Mirrors ecommerce site and are always looking for great content to share and help inspire. Thanks. I have a soft-spot / weakness for banana bread. Your recipe is the perfect excuse to indulge and I was thinking of throwing in a handful of chocolate chips. The lemon cookies with white chocolate are also on my “to bake” list. I JUST made these and oh my goodness, they are AMAZING!!!! I saw your post on Tastespotting and I am SO glad I stumbled upon your blog 🙂 You're a genius for coming up with this recipe! Thank you so much for sharing!! I just tested this recipe and they came out marvelous!! This is the first time i've tried baking with mayo, so i'm impressed with the turnout. I added some pecans for a kick. You must try this recipe. Thanks for sharing Jamie! The banana chocolate was simply delicious. I Love the chips on it. I am so excited about this recipe! Never seen one with mayo, but because of that it means I can make it for my daughter who has allergies (dairy, soy, yeast, etc) and only modify it to use her special allergen free chocolate chips!! I have Kraft’s olive oil mayo on hand. Can I use that? I love this muffin recipe, I have made it a couple of times and yes, you can use the Kraft’s olive oil mayo, I made it that way last week. I love that it uses mayo because we don’t eat a lot of mayo so it helps me use the jar before it expires. yum yum gotta try them muffins got nanners ready now! what do you mean by T as a teaspoon or tablespoon? thanks. I tried baking your quick and easy breadsticks its delicious and i continues baking it and my friends and family loves it ! T means tablespoon and t means teaspoon. These are wonderful and easy to make! I made these this morning and they are almost gone already! EVERYONE is raving about them. All I can say is WOW! Great recipe! This was such an easy recipe to follow.Made these muffins twice and it was a hit each time. I was a little skeptical about the mayo in the muffin recipe but they are absolutely fabulous!